Move over, man’s best friend. According to a 2007 survey conducted by the American Veterinary Medical Association, Americans own almost 82 million pet cats — that’s 10 million more felines than canines. Still, other stats from AVMA indicate Fluffy is less likely than Fido to get regular checkups. Some cats get literally elevated status at Williston’s Affectionately Cats, home to two of the eight Vermont “feline practitioners” listed on AAFP’s website. Multilevel kitty condos allow four-legged boarders whose owners are on vacation to gaze down on the office’s waiting area. 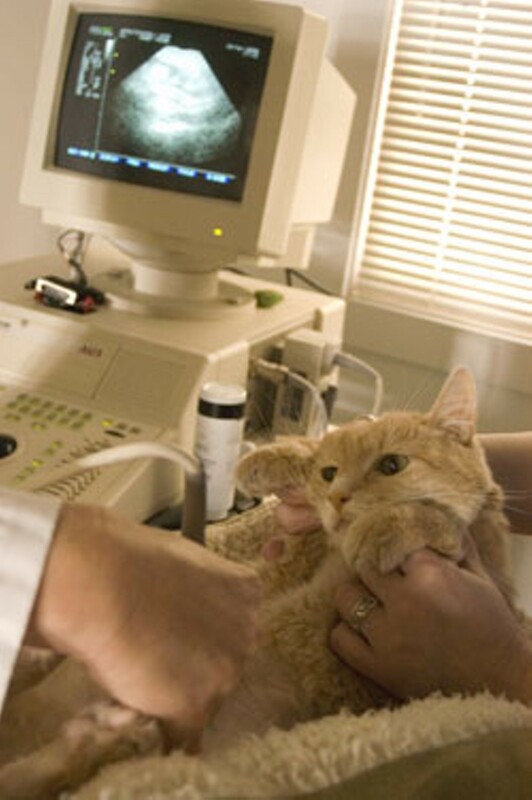 The exam rooms are carpeted — impossible in a practice that allows dogs, says owner Dr. Denise Kessler, who opened Affectionately Cats in Charlotte in 1993. In the next couple of weeks, Kessler will close her Charlotte branch, housed in an old farmhouse, and move everything to the newly outfitted Williston space. 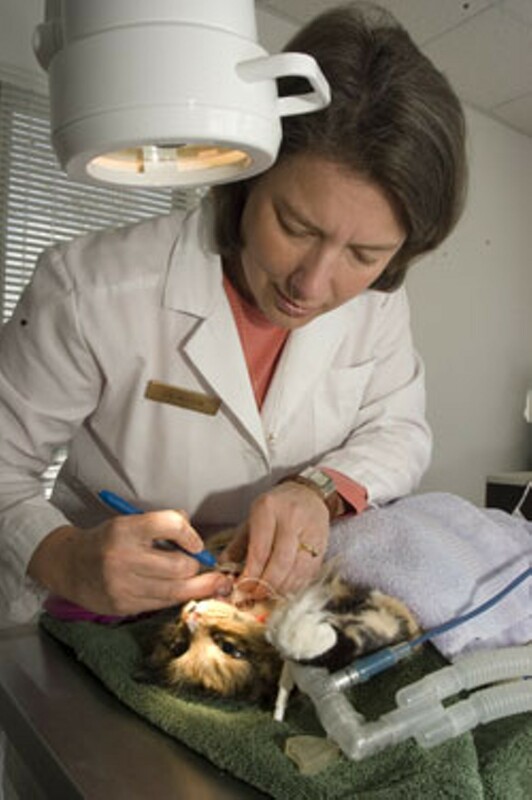 An open house on April 12 will give ailurophiles a chance to hear mini-lectures on topics such as vaccines and kidney disease — and to watch one of Kessler’s own cats get dental care under anesthesia. On a recent Friday, Giuseppe, the office cat, prowls the front desk, looking for a hand to rub. The longhaired 15-year-old — congenitally deaf, like many white cats — is a weight-loss success story: He dropped from 28 pounds to just 14, says Kessler. Kessler, 43, says the watchword among the increasing number of vets catering to felines is: “Cats are not small dogs.” Though veterinary medicine used to lump our furry companions together, they’re distinct in physiology — and, as any devoted owner could tell you, worlds apart in behavior. What do you learn from concentrating on just cats? Seven Days sat down with Kessler to ask her about nails, noise, neutering and the great cat-versus-dog debate. SEVEN DAYS: Why just cats? DENISE KESSLER: The first year and a half I was in mixed practice. Then I got a chance to work part-time in a feline practice, and it was so wonderful to focus on one species. Even just doing feline medicine, it’s still a challenge to keep up on the new articles, the new case presentations. SD: Why don’t cats like coming to the vet, as a rule? DK: Once a year they come out of their apartment or whatever, they’re put in a carrier, leave the building, get in a car; they’re absolutely scared to death, and they have us invade their personal space and go back home. The reason we started the kitten classes was to hopefully start when they’re really young, just coming to the vet. Indoor cats, they don’t see other cats. So when the cat gets really sick and has to come in, there’s a whole extra level of stress. SD: Do any of your patients like coming here? DK: I am amazed that any cat is comfortable here. But I come in and some of them, they’ll be spread out on this table, purring. Most cats tolerate it pretty well. Probably 10 percent are really frightened, and those cats we wrap in towels: They feel safe. There are very few cats that are so terrified we actually have to sedate them. I do use Valium more than I ever did before — for cats that are really anxious, to relax them before they come. SD: Barring drugs, what’s the best way to make a cat stay still for, say, nail clipping? DK: I had a great conversation with a client this morning who has a barn cat that’s kind of skittish. She was telling me how she’s treating the cat — she says, “I get about one nail a day, ’cause it takes about half an hour.” She’ll get down on the floor and crawl up to the cat. She’s doing an incredible job! If you can start with a kitten, and you’re giving them treats, and you learn how to do it correctly — that’s how. Later, it’s tough. SD: What’s the number-one question people ask about their healthy cats? DK: “Do their teeth need to be done?” And “Are they too fat?” Obesity is a huge problem, because our over-the-counter foods are so high-calorie, and most cats that are domesticated are kept indoors, so they’re not out there exercising. SD: How do you slim down a kitty? DK: A lot of people come in feeling embarrassed because their cat’s so big. We actually have a weight-management plan where we calculate how many calories this kitty should have . . . we choose a food . . . and then we measure out how much they can have each day. You can’t have cats lose weight too fast, or else they’ll develop liver disease. Some cats are just so sedentary. If that’s the case, we need to find a staircase and feed them at whatever end they don’t usually hang out on. SD: How do you know your cat is sick? DK: What makes cats so different is that they hide disease, unlike a dog. Owners I’ve been with for 18 years — and they know their cats — will come in one day, and their cat has crashed with serious disease. It comes on so slow, because cats’ instinct is to not become prey. I just cannot believe how much disease they can have in their body and be alive and not show anything. Big masses, half their insides, or kidneys that have nearly totally shut down. It makes it tough, and that’s why cat medicine has evolved. SD: Do cats live longer nowadays? DK: In general now, cats will make it to 17 or 18 really easily. Fourteen used to be old. SD: Have people changed in their willingness to try expensive procedures for their cats? DK: Yes. Cats, as a whole, have become much more important; there are now more cat pets than dogs. Because our society is so mobile, cats have become this community that can move with their person. With that, I think there’s a rise in the care that people want to give them. SD: What’s the most you’ve seen someone spend on a cat’s health? DK: Twenty-five hundred isn’t uncommon over the course of an illness. Four to five thousand is getting to the upper end, whereas dogs can easily get up to $10,000. Cats are smaller bodies; they take less drug. Our pharmacy here is tiny compared to a mixed practice. SD: How many of your customers have pet insurance? DK: Very few, I think I probably have two. There are so many loopholes, as far as what they’ll cover and what they won’t, that people have not found it to be really beneficial. SD: Do you sometimes have to convince people to let go of a dying pet? DK: I don’t think of it in terms of having to convince people. My job as a veterinarian is to give as much accurate information as I can and let the people choose. Sometimes that is, “I think your cat’s in an extreme amount of pain,” or “I think your cat has four days to live.” And they’ll often ask me, “What would you do if it was your own cat?” I’ll tell them that, if I think the majority of my cat’s day is spent in misery — because I believe that they live in the present frame of mind — and I cannot cure them, then I think it’s time to go. SD: You say cats live in the present. Do they have memories, or just instincts and conditioned responses? But, yeah, they have memories. If they see a cat carrier, and they’ve had a bad experience, bad pain control when they were neutered — the next year, they’re not going in that carrier! SD: What about personalities? Are cats individuals? Do they tend to be “aloof”? DK: Oh, my. Even my chickens have different personalities! Dogs are gregarious — they’re in your face; you have to notice them. Cats you have to study and see what’s going on. Relative to an in-your-face dog, they might seem aloof. But there are cats that, just like dogs, will wait at the door for their owners. They know when the children have gone to bed, so they’ll come out and get their time. They’re small; they don’t want to get stepped on. They have to be careful in the wild. That’s probably where that [notion of feline aloofness] comes from. It’s protective. SD: How do you tell if your cat is smart? DK: There are people that come here with multiple cats, and they’ll say, “This guy is smart, and this guy is dumb as a box of rocks.” They watch ’em, and they know which cat knows how to open a cupboard. We have one cat that was put on “America’s Funniest Home Videos.” This cat could open a jar with a screw lid. His food was inside it, and he’d reach inside and pull out a nugget. He was just a clever boy. With clicker training, cats can be trained. There are some cats that people have trained to use the toilet, which I am very impressed with and have not taken the time to do. One of my instructors, she had a cat named Pierre, and she’d walk down the hall and say, “Heel,” and he’d follow, and “Sit,” and he’d sit. SD: Tell me about your cats. DK: Rosie, Uncle Marvin and Kabooka. When we got Kabooka, Marvin turned into “Uncle Marvin” because he would tolerate this little kitten fighting all over him. He’s this very sweet personality. Kabooka is a rascal, just into everything. Then there’s Rosie, the queen. Thinking about patterns in cats — I have three boys, and she waits till they’re in bed, and the moment my middle son is under his covers, she’s there, and she lies down on him. If that ever changes in her, I will know something’s wrong. SD: Cat people and dog people. Can you be both? DK: I’m both. I have a dog. He’s so much work compared to the cats, but I do like him very much.